Pour into a foil-lined 9X13 baking pan and bake 40 minutes at 350 degrees until lightly browned. 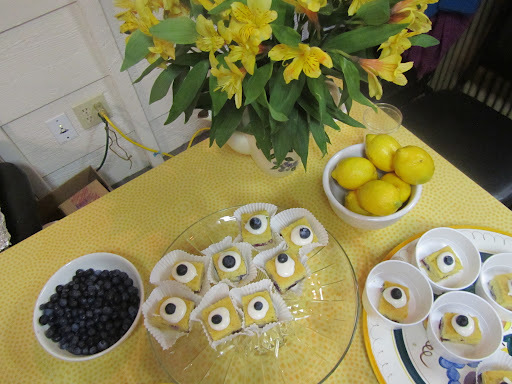 Best served warm, but we couldn’t do that at the Cook-Off, so we made a topping with mascarpone cheese whipped with confectioners sugar (to taste) and fresh lemon juice (to taste), then garnished each square with a fresh blueberry. When we ran out of mascarpone, we used cream cheese which worked just fine! Combine that with red-hot music by Tom Hill & The Midnight Suns and you have a really fun evening and a nice break in the Highlands mid-winter cabin-fever blues! 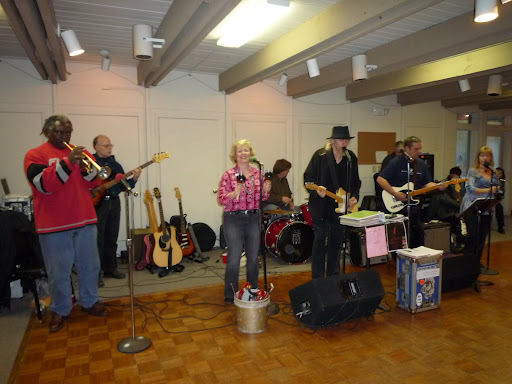 The band attracted the best crowd ever and was sponsored in part by Colonial Pines Inn. 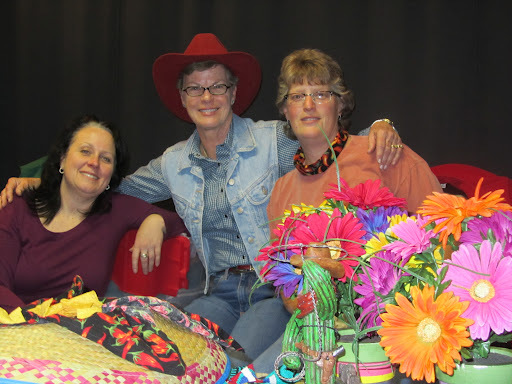 Debbie Grossman (on right) and her crew from Fresser’s Eatery entered several types of chili and won “Most Unique” for her fabulous Crab Chili. But my favorite was her Ginger-Pear Salsa which was, without a doubt, THE BEST. Maybe she’ll give me the recipe – what ya say, Debbie? Thanks to husband Chris, and especially niece Lauren who came over from Virginia to help out. 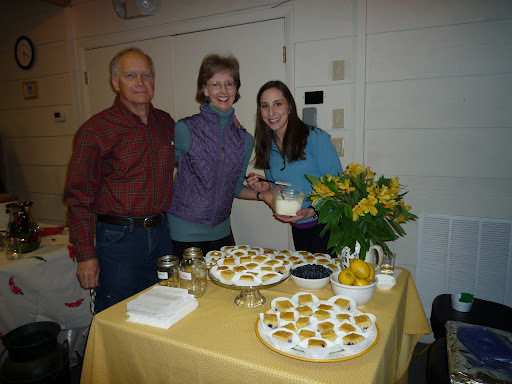 The blueberry cornbread with mascarpone/cream cheese sauce ideas were hers! Please email me if you have any questions on the recipe. I apologize for not having the exact ingredients for the sauce, but it was a last minute addition and we were experimenting. Sometimes those situations have a pleasant ending! Thanks for checking in & Happy Trails! Irene Coal Parr from Florida opened Parr’s Guest House in the early 1960’s, later renaming it Colonial Pines Inn. Three owners and 5 decades later, the Inn is having its 50th Anniversary!!! 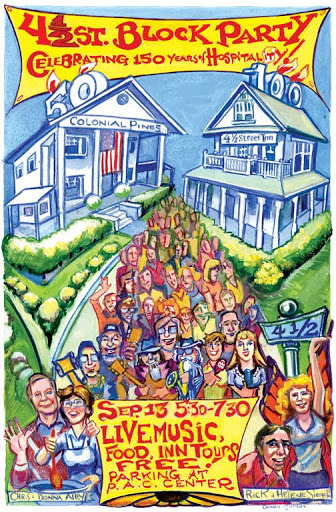 First, you partner with your friends Rick & Helene of the 4 1/2 Street Inn (who are celebrating their Inn’s 100th anniversary), you pick a date (praying for no rain), and you plan a street party & picnic celebrating a total of 150 YEARS OF HOSPITALITY. That’s a lot of cracked eggs! You commission local artist Duncan Greenlee to design a really fun poster, invite everyone in town, and send out email invitations to all your past guests. You get permission to block off the street between the two Inns, load up on supplies from Sam’s, order a keg of beer, and make TONS of cole slaw, hot dog chili, and brownies. You get a noise permit and hire your brother’s blues band, “Tom Hill and The Midnight Suns.” Whatever happens, at least you will have great music! You borrow a HUGE grill from Bill & Sara Mann and grill 250 hot dogs. …but you are thrilled at the huge turnout! The weather’s even more beautiful than you imagined and everyone’s happy. It’s an event to remember! The saxophonist does a great job with his brand new instrument..
…and you make sure even the children are glad they came. The sun goes down but the band plays on. 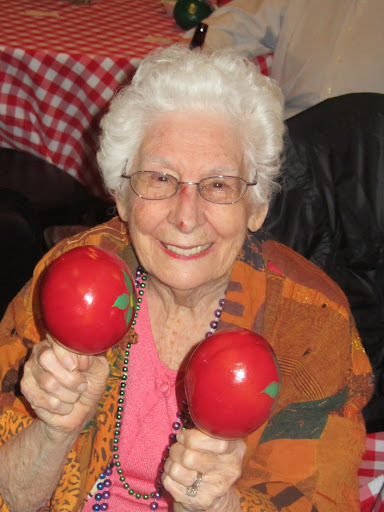 You dance and a have a great time at your own party. You are extremely grateful to all your relatives who came from three states to help out: Meghan, Aunt Pam, Aunt Susan, Tommy & Rosie. 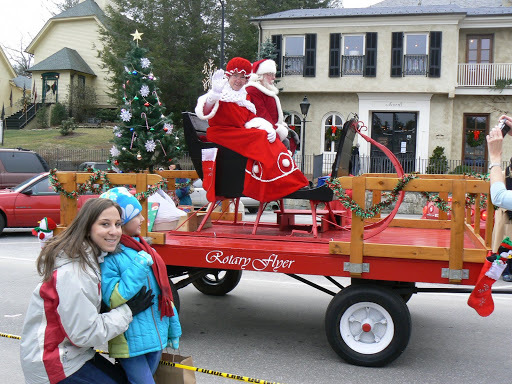 and be a guest at Colonial Pines Inn in 2012! Hope to see YOU soon in the mountains! We are open for the 2012 season! “Second Night Half Price” through April. 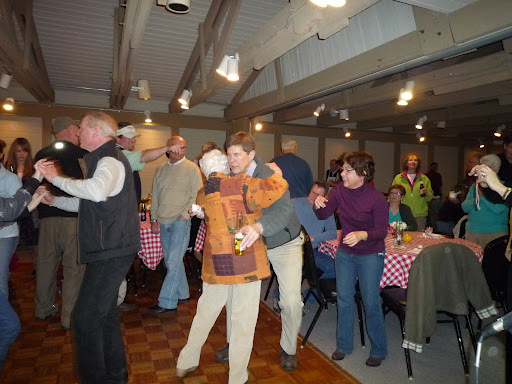 Tour the Inns, dance, and enjoy old-fashioned hospitality. 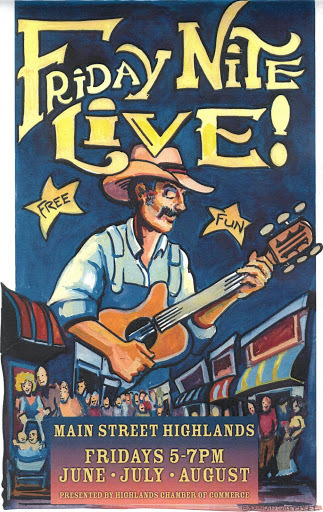 Parking available courtesy of the PAC Center on Chestnut St.
Friday Nights are aLIVE with Music – All Summer! Do you dream of violins playing as you descend a grand staircase in heirloom lace to a roomful of adoring friends & relatives? If so, Colonial Pines is not the place for your wedding!!! 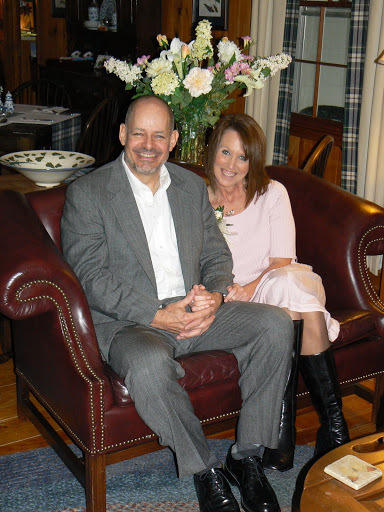 However, a surprising number of couples have chosen to have small, impromptu ceremonies here and put the big bucks needed for the aforementioned event toward graduate school, paying down their mortgage, or beefing up their 401K. Not a bad idea in this economy! 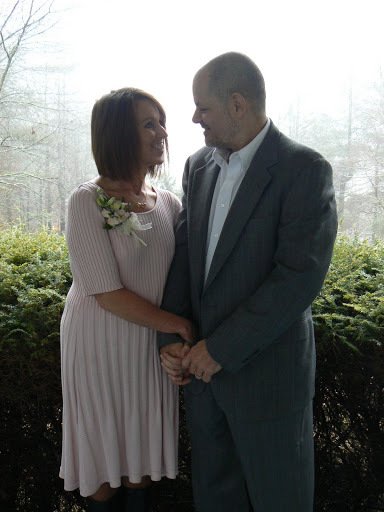 One such couple is Laurie & Ernie Prodromides of Greenville, SC whose plans for marrying near a waterfall were foiled by a rainy, foggy mountain day. Instead, a crackling fire provided a perfect setting for the vows and the fog made for some nice photos afterward on the porch. 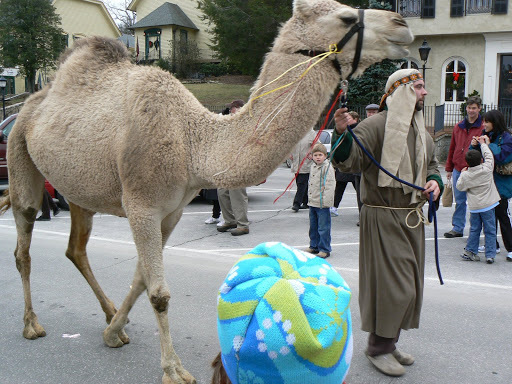 Two Saturdays after Thanks-giving at 11am, Main Street is the place to be. 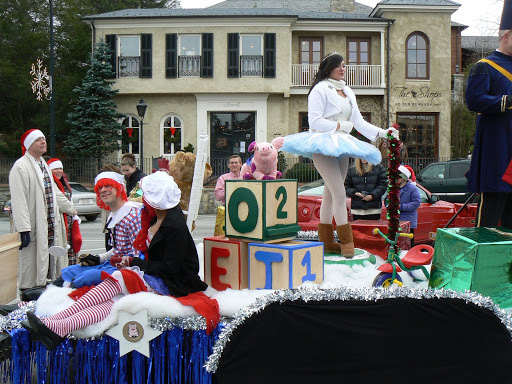 The Highlands Christmas Parade has some of the best floats you’ll ever see in a small town event like this. My favorite is the campsite near a waterfall shown here, but there were also live camels, a walking porta-potty, three colorful male senior-citizen toothfairies with tutus and giant toothbrushes, fabulous vintage autos decorated for the holidays, dogs, horses, and of course, Mr. & Mrs. Claus. 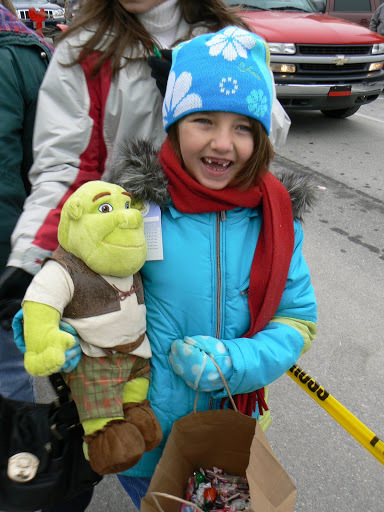 My nieces Lauren & Peyton were visiting and the highlight for Peyton was the Toys for Tots float that gave out large Shrek dolls. After it was over, we all came back to the Inn for Peanut Butter Brownies and Hot Chocolate. Try these at home! Pour into 9X13 greased pan. Bake at 350 for 20-25 min. Expect: Happy smiles like this one!